HOLLYWOOD, CALIF. – More than three decades after they won the Academy Award® for Best Picture, director Francis Ford Coppola’s classic films The Godfather and The Godfather, Part II will once again be enjoyed by audiences as they originally were meant to be seen, thanks to a meticulous restoration by Paramount Pictures, overseen by Coppola himself. 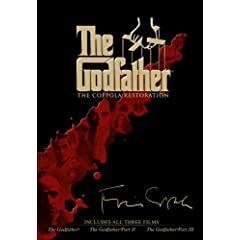 On September 23, 2008, both fully restored films will debut on DVD and Blu-ray, along with a newly remastered version of The Godfather Part III, to be included as part of The Godfather, The Coppola Restoration Collection. All three films will be available individually or in a five-DVD collection or four-disc Blu-ray collection, which are loaded with a host of all-new special features. The Godfather and The Godfather, Part II underwent extensive frame-by-frame examination and restoration utilizing state-of-the-art digital technology in this historic preservation effort, which required more than a year to complete. Robert A. Harris of the Film Preserve supervised the restoration under the direction of Coppola and cinematographer, Gordon Willis. Harris’ restoration credits include Lawrence of Arabia, Spartacus, Vertigo and Rear Window among others. The new special features created by Kim Aubry, founder of Zoetrope Aubry Productions, explores the complexities of the restoration process and provides new insights and perspectives about how the film almost didn’t come to pass as we know it. “The Masterpiece That Almost Wasn’t” relates the unlikely events, intrigue, allegiances and luck that put together the unknown director with the “unwanted” cast and contains interviews with most of the living players and many of the films’ admirers. Other featurettes include “…when the shooting stopped,” and “Godfather World,” which take a look at The Godfather’s influence on popular culture today. Each film includes a commentary by Coppola. The movie comes with English, Spanish, and French subtitles.